Well, time to get back to painting wargaming figures. I'm running a Carentan, Normandy scenario for the local convention this spring, so I've got to get hopping on the forces. 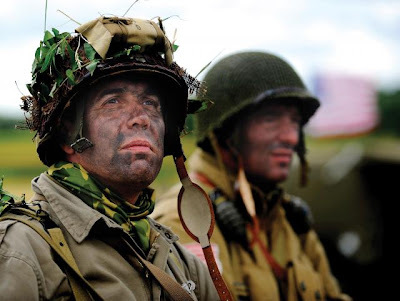 I'll be pitting a platoon of 101st Airborne against a platoon of Fallschirmjagers (a la episode 3 of Band of Brothers). 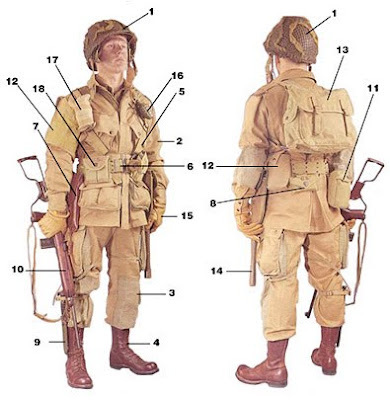 Here's a little source imagery for the American Paratroopers. The uniforms are a sand color, with light khaki webbing and packs. Helmet is dark olive green and boots are brown leather. I'm starting with Artizan 28mm figures. They come in a nice variety of poses and have plenty of character. The bare metal fig...mold lines, bent gun and all! I then do a dark ink pass. This isn't for final shading so much as my aging eyes really need help in seeing the detail of the figure. By doing this dip, I can see where I can expend effort to make the final figure pop. Next I paint the skin (I use the method of painting the figure from the inside out, so to speak). For skin I've recently switched over to the Foundry three-tone system, and add in a flesh wash after the shade base coat. Next I move on to the uniform. This is the base coat with field drab and another ink wash for shading. I layer-paint the cloth. Base coat is Vallejo US Field Drab, mid tone is Green Ochre and highlight is Dark Sand. Leather is done with Foundry Tan. I use this paint progression for the olive helmets and reinforcement patches, as well as the light khaki webbing/packs. Starting from the left, dark green bits start with Vallejo US Dark Green and highlight with Khaki. Webbing starts with Khaki, then the mid tone is Buff and the highlight is Pale Sand. And the result is a US Airborne fig. Base is glue and sand painted in GW Scorched Brown, highlighted with Vomit Brown and Bleached Bone. Grass is GW static grass. And here is the current state of the US platoon...plenty of painting to go! After six weeks, I'm feeling...relieved. Sometimes, in the middle of a big project, I often think to myself, am I going to finish this? Well, I'm happy to say that 8 Albatros D.Vs are now "table-ready" for games of Canvas Eagles. Let's start with an inspirational shot of Flashar letting another British flier wriggle away. The final table shot. Here, landing gear is on, as well as the tail skids and propellers. All planes have been given a matt clear coat to finalize the finish. Now, all they need are pilots (oh, and rigging...but let's be real...I won't rig my game planes 'til I go insane in about 10 years). Speaking of pilots...here they have been cut down to fit in the cockpits, primed and inked. And here they are painted...pretty simple leather paint schemes. Green Tails! The fliers of Jasta 5 were known as the green tails. Here are the five builds, representing planes from July 1917 through to March 1918. See part 1 of these build notes to get short bios of the various pilots. Two planes from Jasta 12. I'm quite fond of the unit paint scheme. Very simple and sharp. Finally, the single build from Jasta 79b. This is definitely my favorite of the eight. A few times over the past six weeks, I felt myself getting bogged down in details; spending too much time on inconsequential areas. My mantra became, "Don't make them good...make them good enough." Examples? 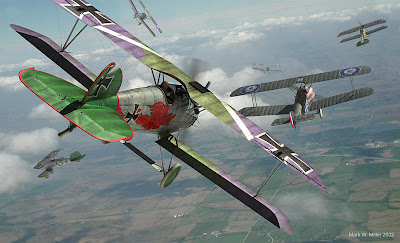 Neckel's Jasta 12 aircraft. The wings are lozenge covered. As such, I decalled over the location holes for the struts. The holes were very small, so in most cases I had to guess where to drill out the guide holes. For the right wing strut lower hole, I guessed wrong. This resulted in a wonky, badly angled interplane strut, which I realized after gluing and upper wing attachment. I wanted to tear the upper wing off, take the strut out and re-drill the location hole and patch the first hole. But this would have diverted building time and be a momentum-killer. The strut was "good enough"...heck, the wing was on, right? I left it. However, on the whole, I have to say I'm very happy with the results. And happier that I can now move onto a new project. Next up...a platoon of 28mm 101st Airborne troops for a WWII Carentan scenario.